MUFF WIGGLER :: View topic - diy harmonic oscillator? Any ideas on how to make something similar to the Verbos harmonic oscillator? Mostly I was thinking of something where you could use sliders/pots to mix the harmonics of a root sound. Ideas included using a divide down structure like a string synth. Not sure how good that would sound. The other idea would be taking the input voltage for an oscillator and multiplying (dividing?) it to drive a bunch of sine oscillators to get the harmonics. This might be the best way to do it, but then would probably require a lot of tuning and buffering to get it to work. The Buchla 148 circuit, which I believe the Verbos one is based on, is a triangle core oscillator and a lot of waveshapers. You need 3, 5 and 7 (and maybe 9?) stage folders to generate the odd harmonics, and frequency doublers (full wave rectifier, level shift and scale) for the even harmonics. Then sine shapers for each output, and probably a VCA for each output too. It is definitely doable but a non-trivial project for sure. I think the toughest part is getting all the odd folds working, which will require some careful trimming, or a fold circuit that I don't know about. The other idea would be taking the input voltage for an oscillator and multiplying (dividing?) it to drive a bunch of sine oscillators to get the harmonics. This might be the best way to do it, but then would probably require a lot of tuning and buffering to get it to work. I like the voltage idea, because then you could probably do like a scaling adjustment (1 octave, half octave, etc) across the board very easily. My concern though is having a bunch of oscillators that stay in tune with each other. The waveshapers would more likely stay in tune, but seems to me like a very complex circuit to do? 16 sine oscillators, each with their own DADSRs (amplitude), PAN, and LEVEL controls. Been working on making this a product.. Here is a video I posted a good while back testing it out. If that's the case, its a very much doable diy project! If this is totally bogus, apologies in advance! This is something I’ve been working on sporadically for a few months in LT Spice. Triangle-core VCO is the best starting point. As stated above, generating most of the even harmonics (2nd, 4th, 8th) is easily done with full-wave rectifiers, amplification and offset summing. The 6th harmonic is derived from the 2nd (with a folder) or 3rd (with a full-wave rectifier). The problem I’ve found is that to get equal spacing between the peaks and troughs of the odd harmonics requires quite a few op-amps per harmonic. I might be using this in a future collaboration so I can’t share a schematic at the moment, but if it isn’t used I’ll likely share it. The Buchla circuit is not quite that, but very similar. The tricky thing (as Isaiah says below) is to do the folding in such a way that you get the actual 3rd, 5th and 7th harmonics rather than "triangle-ish waves that go up and down 7 times for every one cycle of the input". Exactly. My "design" for this uses four op amp stages per fold, so you need 4 for a 3rd harmonic, 8 for a 5th and 12 (!!!!) for the 7th. I'm not doing the 11th. Buchla's circuit is a lot more economical than this but I can't quite believe that it's possible to make it really accurate, unless you replace lots of resistors with trimmers or something like that. So that is a lot of circuitry. Oh, and then ten sine shaper, ten VCAs, and mixing / scaling circuitry too. Sounds like we are taking very similar approaches! Yes, the silly number of op-amps (increasing numbers for higher odd harmonics) sounds very similar to what I’ve got in my simulations. Admittedly, I had stopped at the 8th harmonic, thinking 8 is a nice round number. But if you’re going to all this effort, what’s another handful of op-amps?! Folding the 3rd and rectifying the 5th seems like the easiest way to get the 9th and 10th harmonics respectively. I agree about the Buchla (and Serge) circuits not producing evenly-spaced folds so moved away from them very early on. Obviously they sound great as dynamic wavefolders, but not for our purposes. There's also the Buchla 148, which generates harmonics by wave folding in the way we are describing, but I do find it hard to believe that they are all that accurate. There are several stages that use diodes to clip the signals. 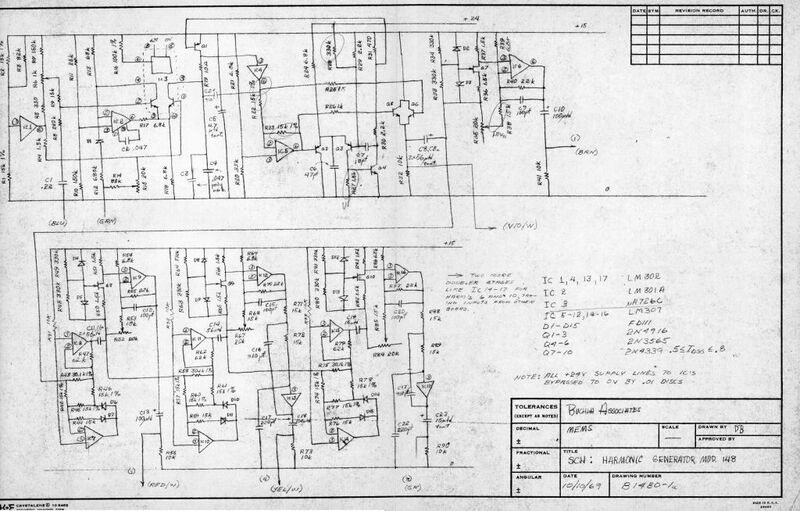 My sketch does the same but drops a couple of op amps in there to make the clipping more precise. It may be unnecessary, though -- precision clipping gives you nice sharp triangles, at least in simulation, but they're heading towards a sine-shaper anyway, so maybe a bit of softness around the folds is ok. Calculated sinewaves with different frequencies and values, add them and put the resulting wave in a fifo and read that out with hardware. Maybe you could use a polyphonic analogue synth in single sine wave voice mode and play the harmonics on the keyboard (of course you need a large keyboard and 6-octave-long-fingers...). But playing the harmonics via MIDI notes should be possible and you can use velocity for the harmonics amplitudes. it would be nice if someone better then me at pcb layout would make a board for this! Crazy that someone had the buchla 148 schematics stored somewhere all this time . it's the first time i ever see them on the internet and when i started working on this , i looked everywhere. however i went for simplicity (if you can call that simplicity) and my circuit is probably very close to the verbos, the idea is that any glitch will be significantly softened by the sine waveshapers , and that, if you're going for analog instead of digital (which is more adequat) any irregularities is indeed part of the charm. 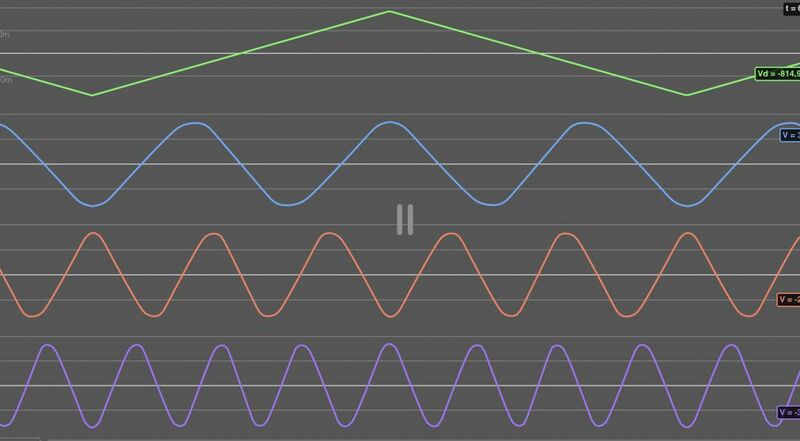 i don't think that 4 stage waveshaping only to get the third harmonic is a realistic goal when you add amplification and sine waveshaping , added that you usually need a bunch of them, however i think it's still an interesting goal to pursue for the sake of knowledge. my design produces "good enough" sines for the 3rd , 5th and 7th. (at least in simulation) , from that, i've arranged circuitry to get the 1,5 , 2,5 and 3,5 harmonics (as they produce an interesting alternative, closer to some kind of polyphony). the even harmonics are a piece of cake. That looks great, raph36. I've been trying to do things like this, at least on paper, for a while so I would love to know how you do it! The 7th harmonic looks really good. - the second schematic above is the odd harmonics. There's a x3, then x5, then x7 section in the main part of the diagram, each with its own sine shaper. The x3 also feeds another x3 at bottom right to get the x9. - run that through the usual Buchla sine shaper (2 diodes and JFET) for the 7th harmonic output. It is amazing to me that this can be made to work. The right resistor values would take some finding. Presumably if you change diodes you will need to rework the gains in the various stages to get the wave to come out looking nice. The x3 and x5 stages are reduced versions of this. As you say, no need for 4 stage waveshaping for the 3rd harmonic. The reason my sketch uses four op amps is that I've got precision clipping stages, so roughly speaking each diode in the Buchla design is drive by an op amp. My hope is that this makes every stage more reliable and less dependent o n diode characteristics, but the cost is lots of op amps. Too many. Subbed, I would be interested in this as DIY or finished. I got rid of my Verbos HO because of how huge it was, and have been thinking ever since about how it could be done in a smaller footprint. there is also the option to get rid of the 8th and the 6th since you have already similarly spaced lower harmonics . also possible is to have the choice beetween the 3rd and the 1,5 with a switch. and so on for 5 and 2,5 , 7 and 3,5 which could make the module considerably smaller. ive been watching this thread, as its something ive been thinking about lately, but i dont feel like i have any great insights to add. 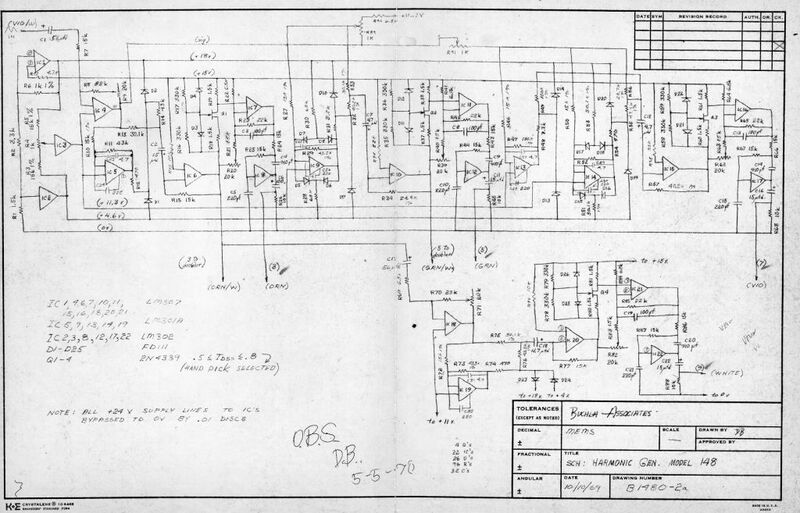 i appreciate the posting of the buchla schematics, as its a method i had not seen before for the odd folds. using a large voltage swing in comparison to the diode voltage helps keep the diode errors small. i agree that the digital approach is least expensive and lowest distortion. but, maybe there could be a hybrid approach with a square waves that are divided down digitally and then filtered through switched capacitor filters to remove the higher harmonics. the switched cap filters could be run off of a higher harmonic of the square wave being filtered, and would therefore track. at some point you end up dealing with very high frequency square waves, and the switched cap filters are a bit expensive, which is why i didnt think it would be the best solution. an alternative to the switched cap filters would be comb filters made out of delay units, but i dont think that solves any of the problems. in the video you can see it going through all the odd harmonics (3,5,7), and if the offset was changed, it would go through all the even (2,4,6). by adding more transistor pairs, you could get more harmonics. also, the tail current of the circuit controls the output amplitude, so the VCA is included for free. the downside is, you have to have a wavefolder per output, and there are a lot of small transistors. you dont have to use as many pairs for the lower folds, so the circuit could be scaled to cut some costs. it will probably average around 1.50$ per stage at quantity, which isnt too bad if you consider its the folder, shaper, and VCA all in one. Seems we are all taking different approaches. My method uses half-wave rectifiers to derive peaks and troughs from the triangle input, which are then added to and/or subtracted from the input signal at different gains. it would demand quite a lot of fiddling but it might be the best approach precision wise. which harmonics are you able to get from that approach ? Another approach i though about but don't have the knowledge to try , was to do it with a classic ramp DCO core ; dividing down the high frequency clock using cmos logic to the desired harmonic frequencies and somehow equally limit the current going to the timing cap.